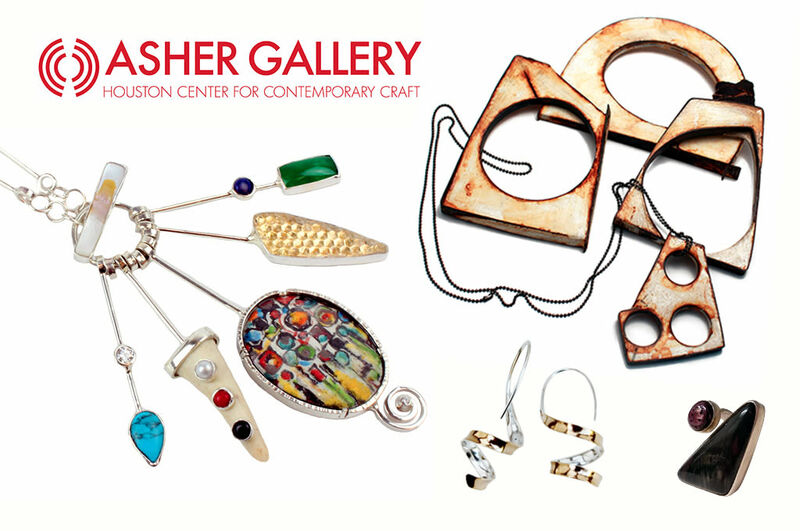 Asher Gallery, located within Houston Center for Contemporary Craft (HCCC), is the perfect place to find unquie gifts in a variety of media and collect work by local and national artists. In the spirit of the holidays and to highlight local talent, Asher staff have selected some of their favorite and most popular jewelry pieces made by Houston-based metalsmiths. Mutual passions for metalsmithing, rock hunting, and object making led Blake Smith and Melanie Schlossberg to found Dirigible Designs. With two studios based in Texas (Austin and Houston), Smith and Schlossberg collaborate using metalworking, lapidary, and bronze foundry. Using materials found in nature, particularly in the Texas Hill Country, they turn stones, rocks, and slate into wearable art. Terry Fromm, a former resident artist at HCCC, creates finely crafted jewelry and sculptural containers by transforming flat, stiff sheets of metal into simple, sculptural forms with an illusion of softness and movement. The metal is formed by hand--through hammering, heat and twisting--into elegant, casual, and intriguing works of art. The resulting pieces have soft, flowing contours that stir an inner sense of balance and beauty. Rene Lee Henry came to Houston in January 2016 to complete a five-month artist residency at Houston Center for Contemporary Craft. Her most recent jewelry collection is inspired by the stylized architecture from the Modernist era, as well as the effects of time and decay on manmade structures. Using polished surfaces marred with corrosion, her pieces reflect a once-hopeful future that has been left in ruins. Amber Tiemann’s jewelry designs are greatly influenced by the clean lines of industrial design and the mid-century modern aesthetic. She combines her love for bold colors with enamel, polymer clay, resins, and stones, creating stunning, memorable pieces. Shop these unique items and more at Asher Gallery. During your visit, make sure to stop by the artist studios to meet the current resident artists and check out the two current exhibitions, “CraftTexas 2016” and “BEST IF USED BY.” Asher Gallery sales help support artists’ careers and free programming at HCCC. 4848 Main Street. Houston, TX 77002. Follow along on social media for the latest deals and events @CraftHouston and @AsherGallery. To learn more and see the curated holiday gift guide, click here!